Definition at line 39 of file llbboxlocal.h. Definition at line 42 of file llbboxlocal.h. Definition at line 43 of file llbboxlocal.h. Definition at line 59 of file llbboxlocal.h. Definition at line 37 of file llbboxlocal.cpp. 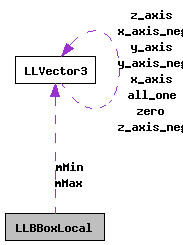 References llmax(), llmin(), mMax, mMin, LLVector3::mV, p, VX, VY, and VZ. Referenced by addBBox(), and LLKeyframeMotion::deserialize(). Definition at line 47 of file llbboxlocal.cpp. References mMax, mMin, LLVector3::mV, VX, VY, and VZ. Definition at line 52 of file llbboxlocal.h. Definition at line 53 of file llbboxlocal.h. Definition at line 49 of file llbboxlocal.h. Definition at line 46 of file llbboxlocal.h. Definition at line 50 of file llbboxlocal.h. Definition at line 47 of file llbboxlocal.h. Definition at line 67 of file llbboxlocal.h. Referenced by addPoint(), expand(), getCenter(), getExtent(), getMax(), and setMax(). Definition at line 66 of file llbboxlocal.h. Referenced by addPoint(), expand(), getCenter(), getExtent(), getMin(), and setMin().